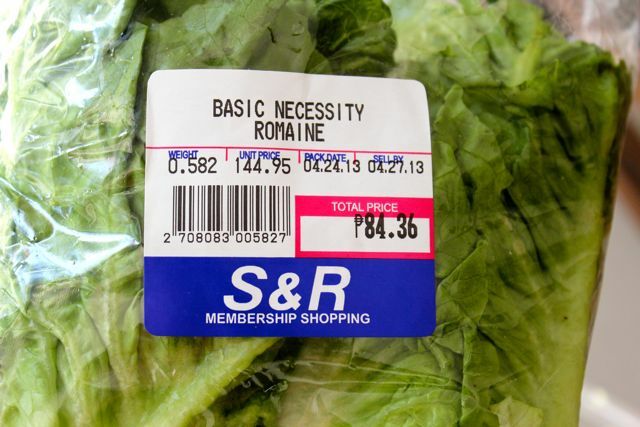 DOLE romaine lettuce was 83% more expensive than the Basic Necessity lettuce displayed right beside it at S&R today. Boo to DOLE! Really, a price differential of say +141% for lettuce in the Makati/Taguig area? I have been eating a lot of lettuce lately, trying to cut back on calories and trying to avoid the kitchen in this wicked summer heat. But as usual, the range of prices for a produce item such as romaine or cos lettuce in Makati/Manila is simply mind-boggling. Outrageous, even. Perhaps most grocery shoppers aren’t as price-curious (read: frugal) as I may be, but just read on to see how much more you might be paying for your produce it you don’t pay closer attention to the cost per kilo of a particular item. I have gotten used to having 3-5 suppliers at major groceries bringing in the exact same veggies, but at differing prices. It is to me simply a confirmation of how utterly inefficient local Philippine production, wholesaling, distribution, logistics and retailing in the Philippines is in the dark ages. Grocery owners can’t rely on any one supplier or wholesaler, so they pit several against each other. But the prices still sometimes present such huge spreads per item that shopping in the vegetable section of a grocery is becoming almost more challenging that going to a wet market where you can rely on sukis to help you out. It’s totally annoying having to hunt through several piles of plastic wrapped produce to see which one is the most reasonably priced. Take romaine, for example. Now grown in several parts of the Philippines, from the Mt. Province to Tagaytay to Cagayan de Oro, this sturdy lettuce so essential to a proper Caesar salad is available say 85-90% of the year. Last weekend, I asked my suki at the FTI Saturday market, Mary, who brings produce down from the Benguet wholesale market, how much her romaine was. She quoted PHP120, but for a suki, brought it down to PHP110. She did add, however, if I bought in bulk, she could swing PHP100 a kilo. And on further inquiry, nodded when I asked if wholesale prices in Benguet might be in the PHP60-80 range. Going backwards further, that probably means farmgate, or close to farmgate prices are probably just PHP30-50 a kilo! Of course along the way there are middlemen and women, paths to be trodden, ticycles and trucks to be ridden, perhaps some tong to be paid, tolls, gas, cargadors, and some 10-20% of the leaves to be discarded before they make it to the big city. But hold that thought, PHP40? at the farm in Benguet, PHP110 RETAIL at the FTI AANI Saturday market in Taguig. Fast forward to an hour ago and I was at S&R Price Club buying some fruit and vegetables. I noticed that there were some three suppliers of romaine lettuce, stacked SIDE by SIDE, if not one LEVEL above another LEVEL in the chilled produce cases. Basic necessity had very healthy fresh looking romaine hearts (means the outer leaves have been discarded) for PHP144.95 per kilo. Not more than a foot away, DOLE Philippines had their romaine at PHP264.95 a kilo! That’s absurd?! Why would anyone in their right mind buy the lettuce that cost 83% more?! Now, wait a minute, you say, perhaps DOLE’s came from Mindanao (where they are consolidating produce from farms not their own, sticking on their label, transporting them and garnering a hefty premium apparently)… or that one was grown in Tagaytay… honestly, does that really matter to the average buyer? Not, I think. And it’s not like there is any or much value added, as the lettuce is as it appears when it was harvested. Was it washed in a anti-bacterial wash?, was it raised organically? (yes, I would pay more for that), is it fair market pricing so that farmers were paid more for their toil? or is the plastic they use better than others? Of course it’s a free country and all, but I just find price differentials like this for commodity products, displayed side by side, to be outrageous. And there is NO VAT on raw, no value added produce, so taxes can’t be the issue. And if you look at almost any other product in the produce section that is “branded” you will find some significant differences in prices, but not necessarily any difference in the quality of the produce. So wake up and crunch the lettuce, the next time you shop, take a good close look at the price per kilo, and you may just end up saving yourself a pretty penny, or peso, or thousands of them over a few months time. MM, I read an article years back that farmers who bring their produce down to manila will have to contend with ‘checkpoints’ along the way wherein each checkpoint would cost them close to a sack of produce. By the time they reach balintawak they would have ‘given out’ at least P10t to P15 worth of goods. You may try going to sagada and buy a sack of cabbage or lettuce, roughly 5 extra large heads, for P30. I was so surprised since each head would easily cost double for each in any manila supermarket. Or try Metro Gaisano where they sell a pack of lettuce for P20 for 2 sprouts. I bought several at their Alabang branch. It didn’t have a particular brand so I’d like to think this is under their own brand. This is way cheaper than those of dizons and the other brands. snr prices are higher than others. hey mm when is the next mm eyeball- we can have it here in iloilo. Any reaction or explanation from Dole as to why their romaine is priced so much more than other brands? Perhaps it’s the “premium” consumers pay for the name “Dole?” Not worth it, I think. Boo to Dole indeed. In SM Dasma supermarket romaine lettuce from different sources range from 94php-140php-280php. Of course Dole has the worst price and the quality between 3 sources have little difference. In SM Bacoor prices are even worse, the Dole brand goes for 350php per kilo!! I agree with everyone’s sentiments. I remember a time in the Philippines when Romaine lettuces even reached 450 per kilo. I miss many of the Filipino food but I console my self here in the US that salad staples are cheap and priced for the common people. Just the other day I bought a head of butter lettuce around 2 lbs for 99 cents. Romaines are about 1.50 USD per head. Of course we have to pay more for a famous brand. The obscene price differential subsidizes the executive perks behind the brand infrastructure: outrageous salaries, luxurious vehicles, golf club shares, “travel” (i.e.- junket) expenses, etc. For example, stating in one’s resume that he/she is a VP for Basic Necessity doesn’t quite compare to being a VP in Dole, never mind that both jobs essentially deal with selling the same kind of edible leaves. I do agree Rustan’s have higher prices but they have more variety in their shelves.If you need just the basic things I think Puregold have the lowest price. hay, life in the city. our electricity rate is one of the costliest in the world, even lettuce, what more? It’s so absurd why there’s this huge disparity in prices for produce. Hope someone with the knowledge explain why this is so. Should there be a regulating body watching over the prices of produce? If you found P264 ridiculous, the prices of Dole romaine was at P650 per kg after one of the typhoons last year. Dole is not the only high price vendor in the market, you should check out the produce of Dizon Farms. Also, check the prices for something as mundane as corn in S&R, you’d be surprised how much the prices differ of the 2 brands they carry. i was just in baguio. Manila prices are too much! MM, the P650 per kg price happened after a typhoon or torrential rains hit the Baguio romaine crop which totally wiped it out for a few weeks. Dole was the sole supplier of romaine at the time since their lettuce came from Bukidnon. Classic case of disaster related price gouging. Also, there were no fresh herbs like rosemary and thyme for quite a stretch from October to December last year, as most farms in Tagaytay were inundated with torrential rains. The main difference was that whatever little supply was available was still sold at pre-typhoon prices. Either the farmers in Tagaytay are a more conscientious lot, or their produce had a readily accessible substitute in bottled dried herbs. I’d like to think it was the former. good for salads, sandwiches, and for our pinoy sabaw :) …..its expensive here though…. romaine lettuce,iceberg lettuce costs around 10dkk/70php @ 7.0 conversion rate..
Carla, the post was for Manila prices, and the PHP84 is the price per portion, the price was actually PHP144 per kilo. In Cebu, lettuces seem to be quite expensive, though organic markets might have cheaper romaine from Busay. In the carbon, I ran across iceberg from Mantalongon for just PHP20-30 a kilo! 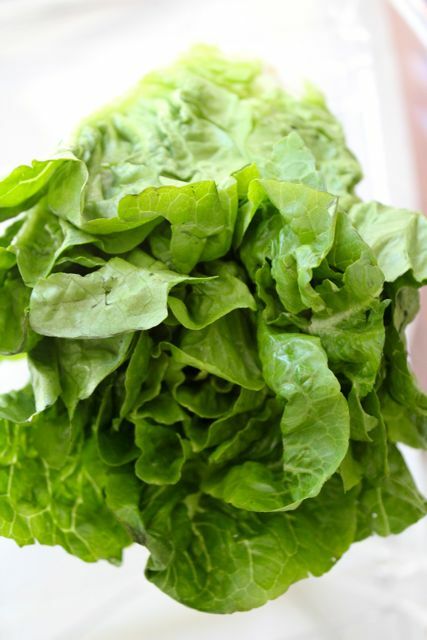 makes me glad I live in Baguio, we get romaine anywhere from 30 to 90 a kilo depending on the weather! I have to agree with you, we as a country no longer produce competitively priced veggies, as much as we used to. the farmers need the support of government, specifically in the area of transporting produce. I am a farmer. True, we lost so much in transportation. Vegetables transported to Baguio City cost P1.00 per kilo. A truck with 10tons will cost P10,000.00. But if prices go down like this time, a farmer goes empty handed. manila prices as so high ,,,while here in baguio and provinces we are giving them at cheaper prices just like the sayote like that they are food for our dogs and pigs……if you want to start a vegetable business..their at manila…we can help…you…. malachi green farm located at angat bulacan with contact numbers 09752026418 and 09178676502, we plant and sell lettuce 60 pesos per kilo fresh and organic.